A handful of former Broncos are getting the star treatment in the GTA. Former Humboldt skaters Jacob Wassermann, Ryan Straschnitzki, Xavier LaBelle, and Laye Matechuk are the honoured guests confirmed to be dropping the puck when the Aurora Tigers take on the Newmarket Hurricanes for Rogers Hometown Hockey on December 8. And when the two franchises hit the ice to renew their storied rivalry in front of a sell-out crowd at the Aurora Community Centre, the boys should feel right at home when the puck is dropped in an extra bit of remembrance. What came next was a phone call between Thomson and Chris Joseph, a friend from their days in the NHL and the father of Jaxon Joseph, who was one of sixteen to lose their lives in the bus crash that April evening. “He reached out to the group, and they were excited to come down,” said Thomson, who was moved by the tribute to the players at the Broncos season opener earlier this fall. 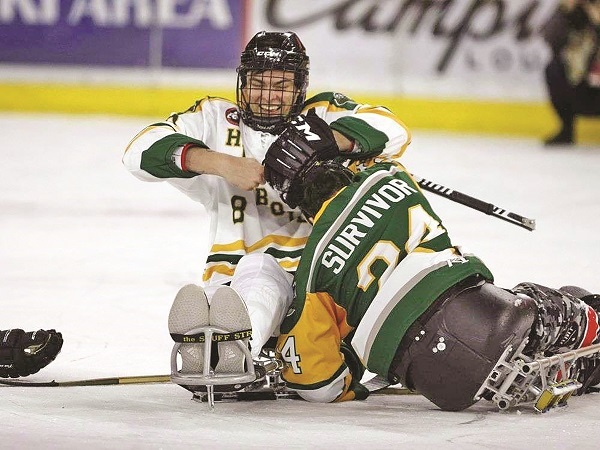 Both Wassermann and Straschnitzki have been confined to a wheelchair since the accident, a moving sight to see when they wheeled onto the Broncos ice surface. Thomson said how the whole event has unraveled, from the accident to the rebirth of the Broncos season, inspired him to reach out. Thomson touched on the loss of Jaxon to his friend Chris Joseph, someone he has known since growing up in Alberta. Both Jaxon and Thomson’s son, James, who was playing with the Tigers at the time, are 1997-born players. The action doesn’t stop there for the Broncos: the Thomsons, as well as the Tigers and the community as a whole, have stepped up to make sure the boys have a whirlwind weekend in Southern Ontario they will never forget. Thomson was even able to connect with Maple Leafs General Manager Brendan Shanahan, who he played with in Detroit, to arrange a meeting with some of the players, while local businesses are chipping in to provide the boys with some hot meals, like The Keg in Aurora and Motorino Enotica North in King City. The OJHL are donating Hockey Hall of Fame passes to the boys and their parents. “Everybody kind of came together once we started talking about it, and it’s great to see everyone get involved,” said Thomson. An extra bit of giving for the holidays: The Tigers are using the action-packed Hockey Day in Canada weekend to run a food drive, with a heated cube donated by Access Storage being used to house donations at the Aurora Community Centre. “Both the Humboldt Broncos and Aurora Tigers will be involved, we want people to bring as many non-perishable foods as they can and we want to fill it for the hungry over the holidays. The cube will be on the ACC grounds from December 7 – 9. The annual Teddy Bear Toss will also run on the December 8 game, with donations going to Southlake.